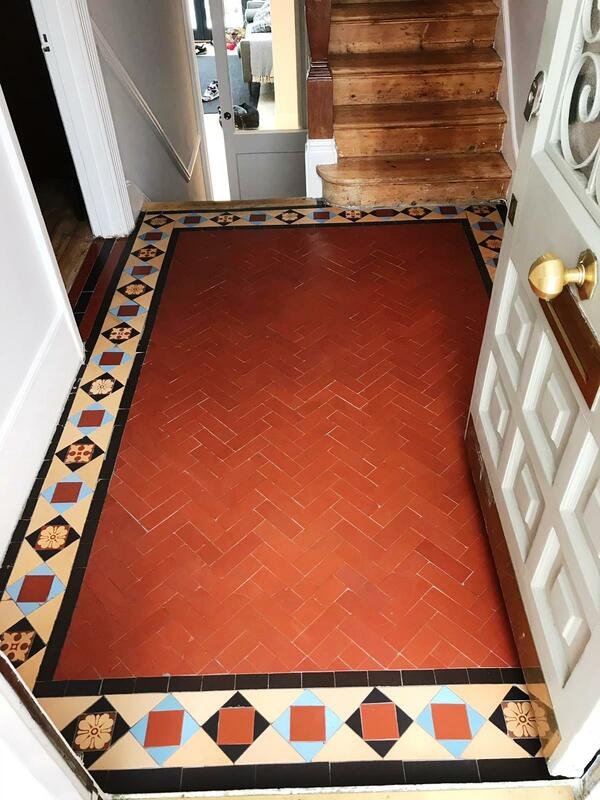 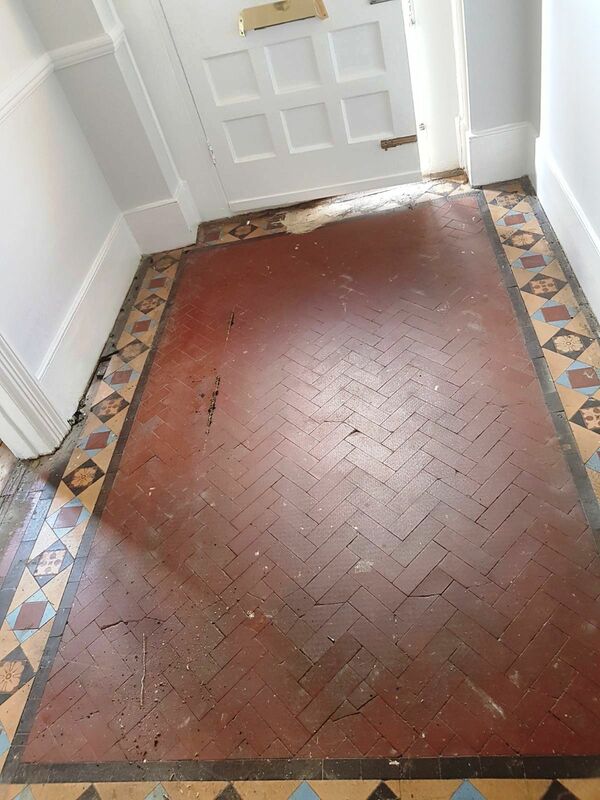 I received a request to take a look at renovating this old Victorian tiled hallway at a ground floor flat in Sheffield. 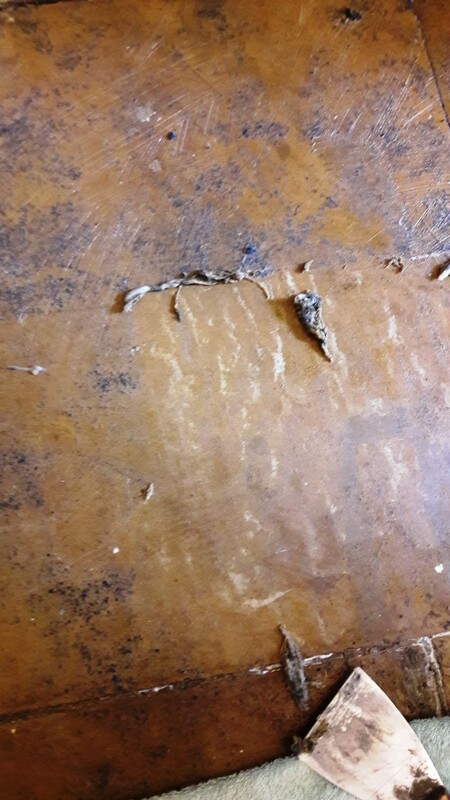 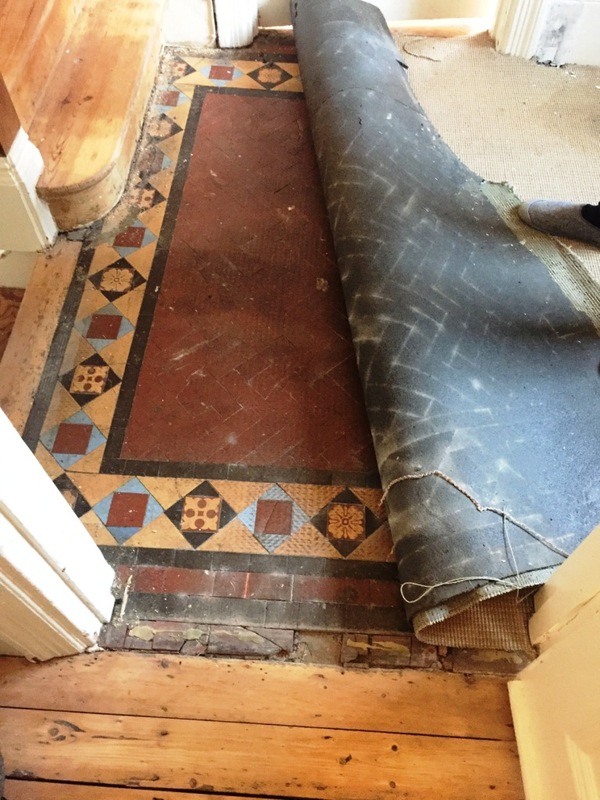 The home owners had recently bought the property and had uncovered the floor under an old carpet. 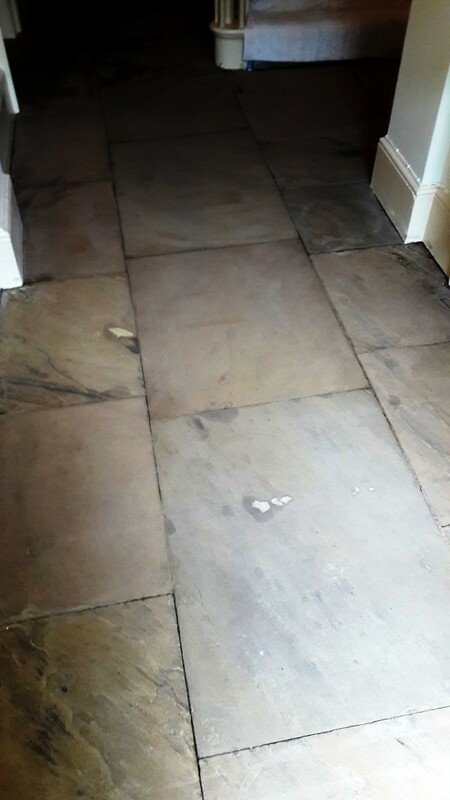 They wondered if the floor was fixable and worth getting repaired, cleaned and sealed. 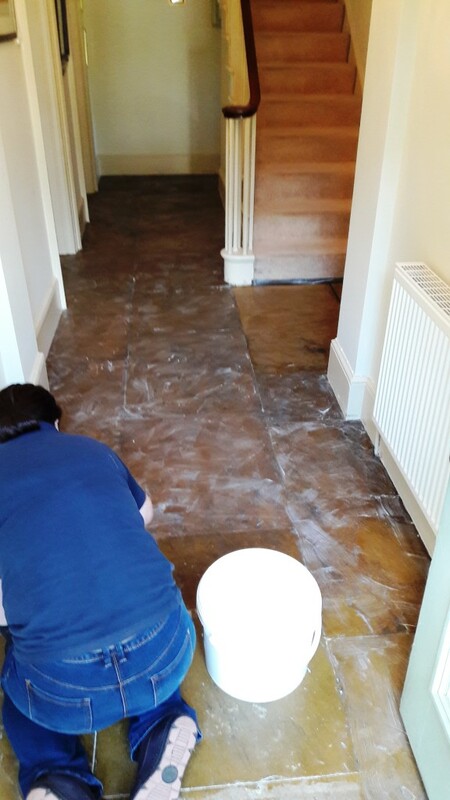 The floor was in quite a serious state with patches of sunken areas which had been covered in a levelling compound. 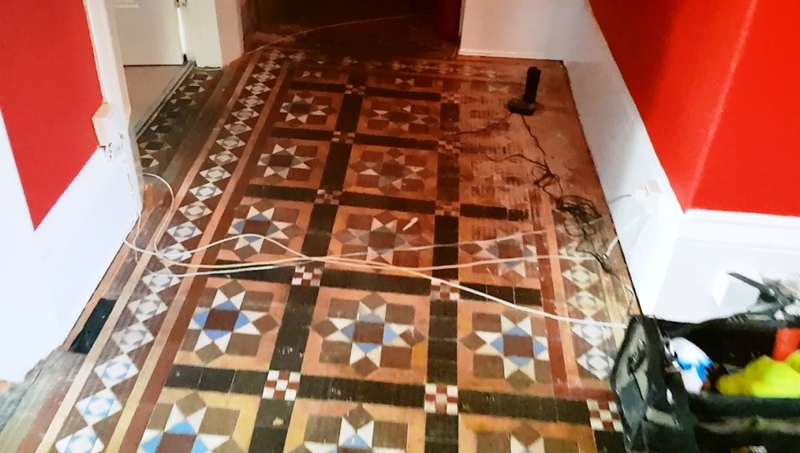 There were many cracked and loose tiles and there were a lot of stains, carpet glue and paint on the tiles. 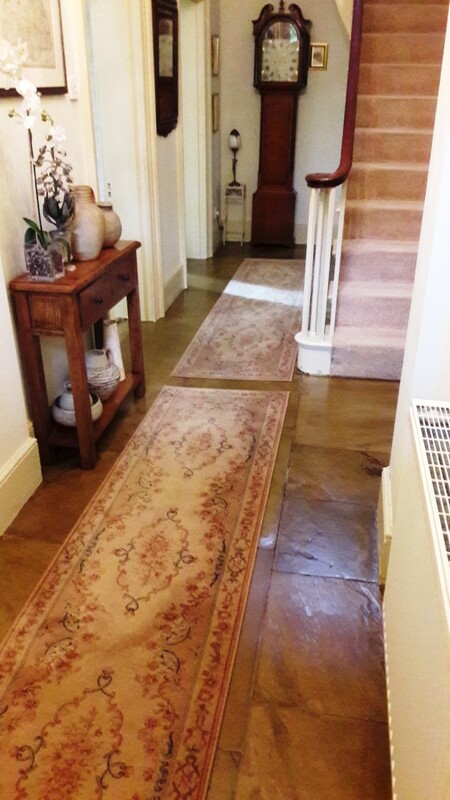 The home owner had done some research into the property and had found out that it was once used as Doctors surgery and the hallway had been the waiting room which would make sense as it had certainly seen a fair amount of wear over the years, especially around the door thresholds. 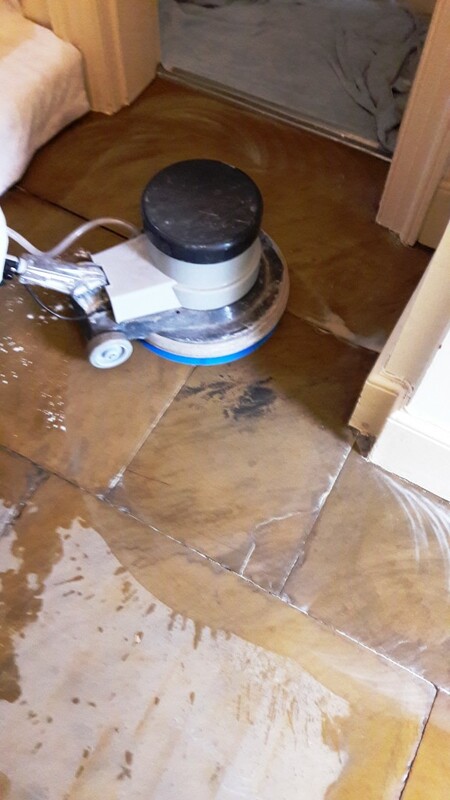 Our client wanted the existing floor repairing, cleaning and sealing, ideally without replacing the cracked and sunken tiles. 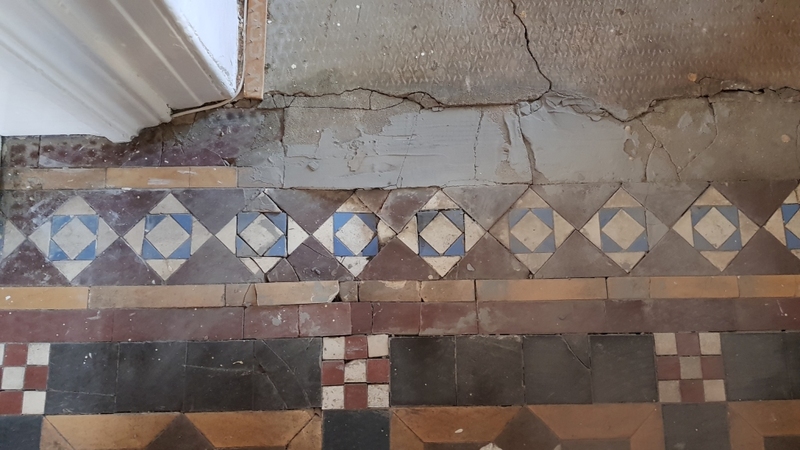 They were very keen to try and restore the floor as an original feature which I’m sure you will appreciate are very sought after. 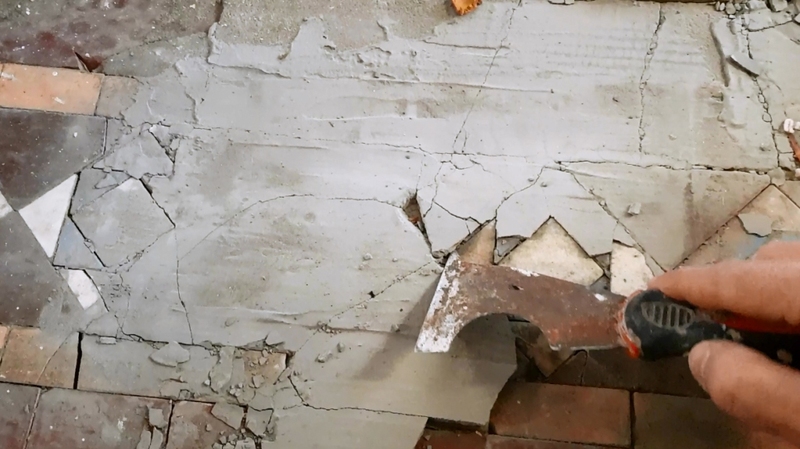 I discussed the work that would be needed and how we would proceed. 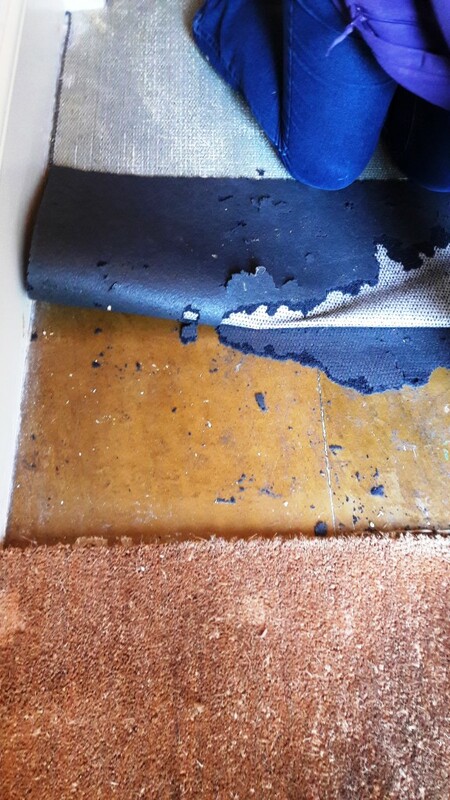 They accepted the price for the work and worked out a date for the work to start. 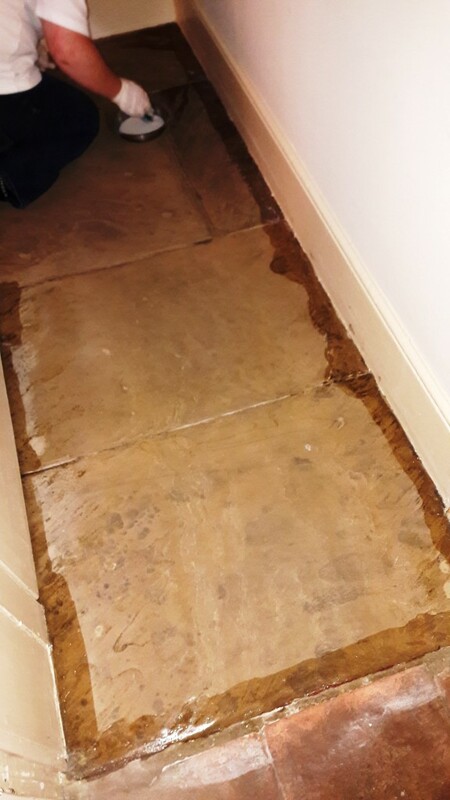 We were able to commence work the following week and started by removing all the self-levelling compound that had been applied to the areas of sunken tiles. 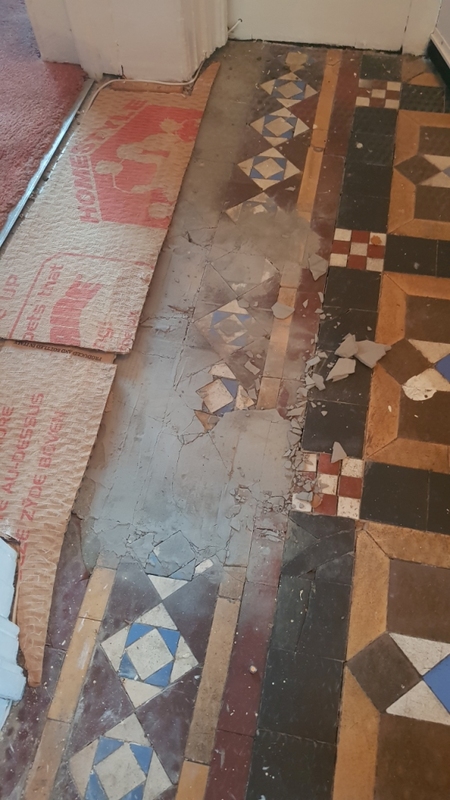 The tiles were also removed in these areas and a new sub floor created to lift the floor in-line with the rest of the hallway. 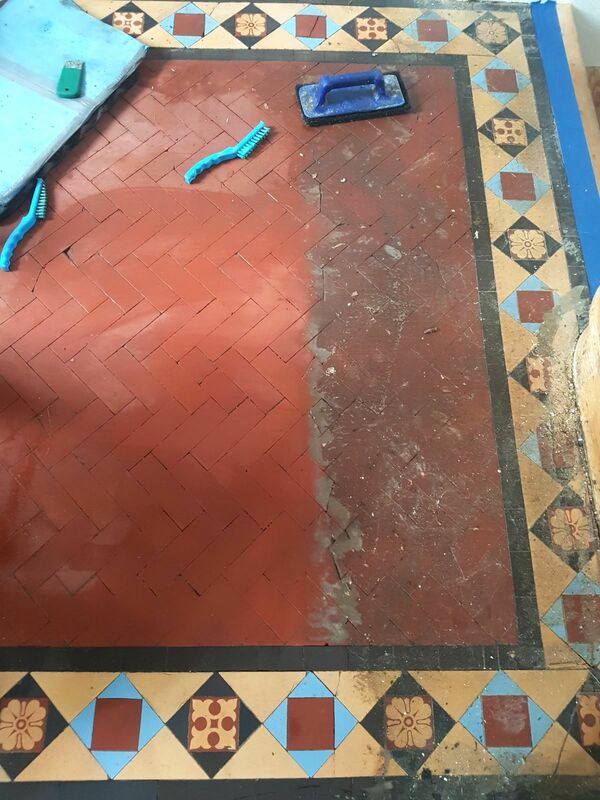 The original tiles were then cleaned up and installed back in place. 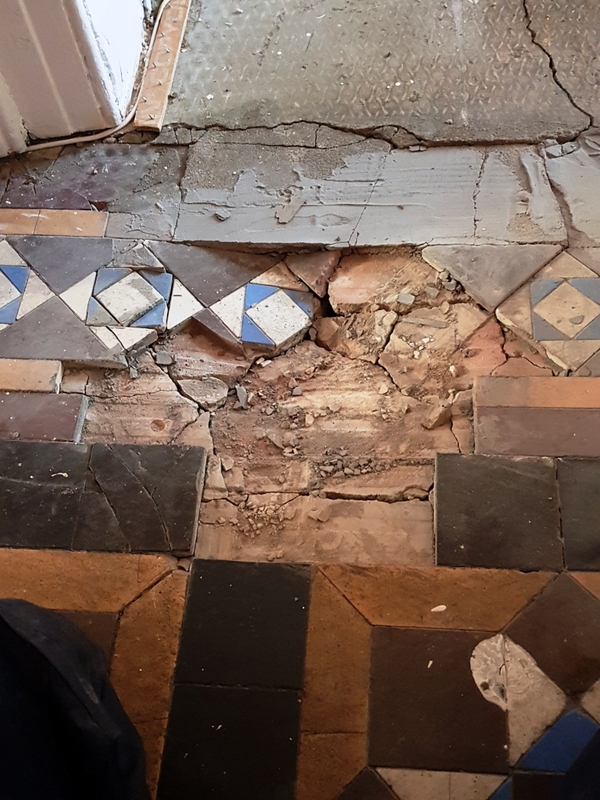 Nearly all the many loose tiles were removed and re fixed in place, unfortunately a few loose tiles were left as removing these would have caused more damage to the floor. 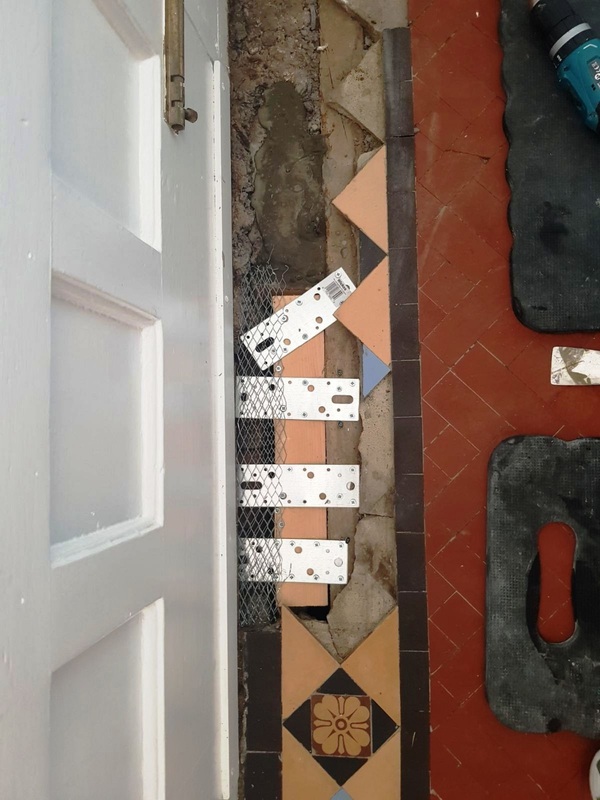 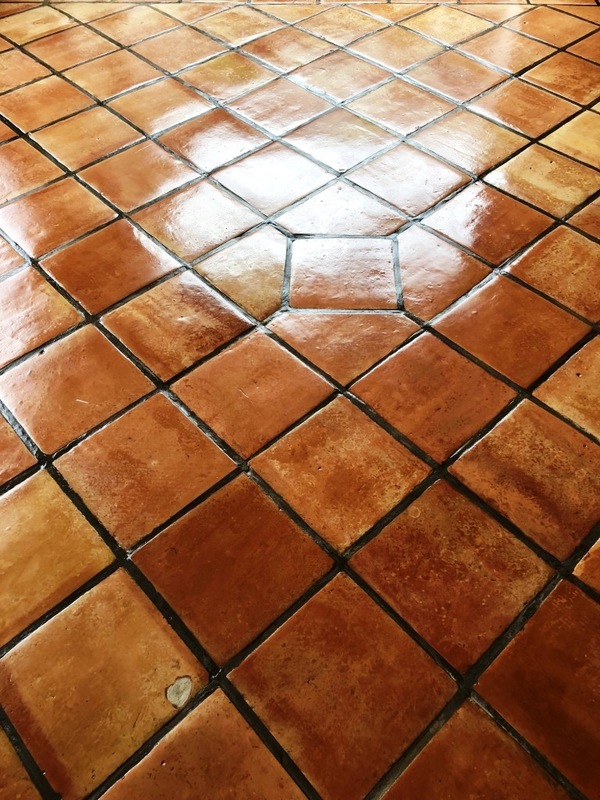 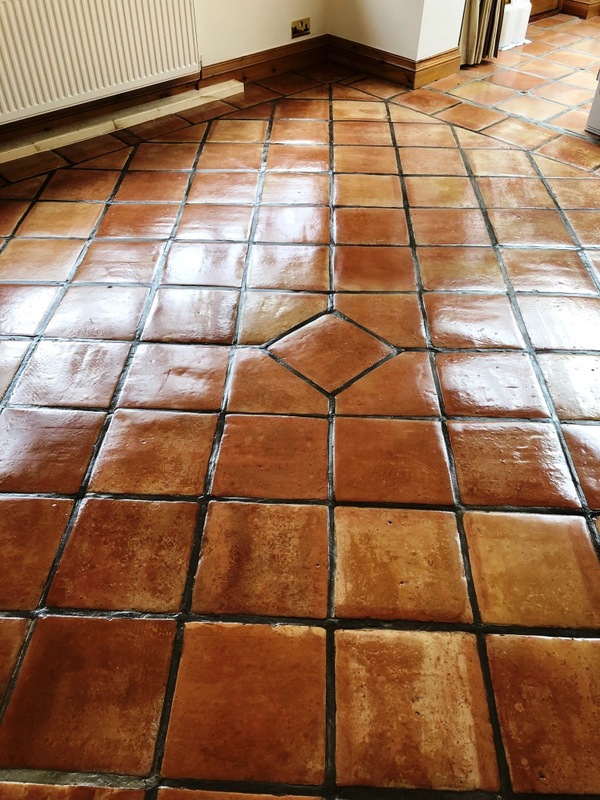 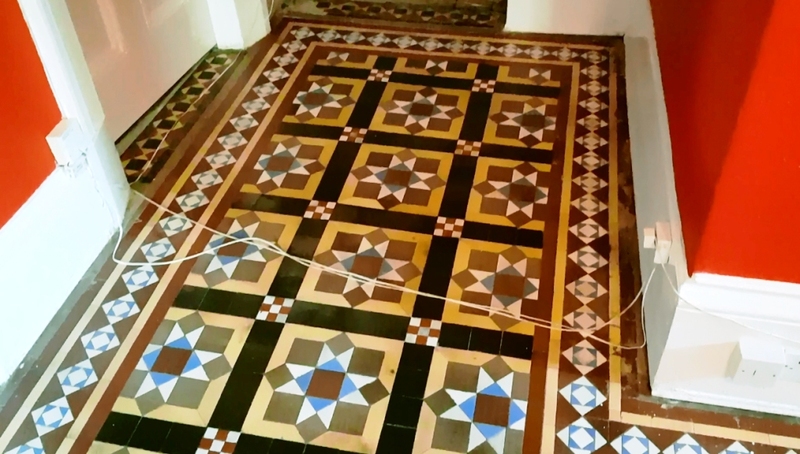 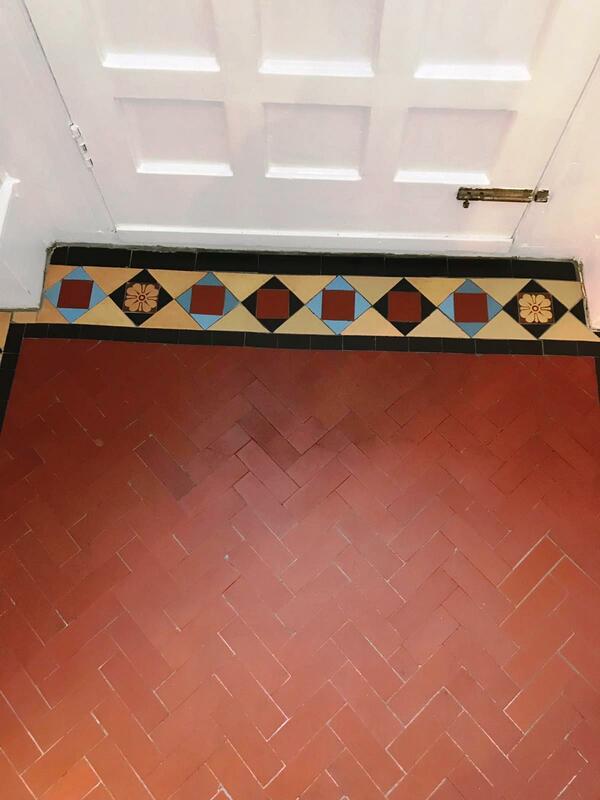 There were many areas of discoloured and stained tiles so after the fixed areas of damage had been left to set overnight, we returned the next day to start on cleaning the tiles. 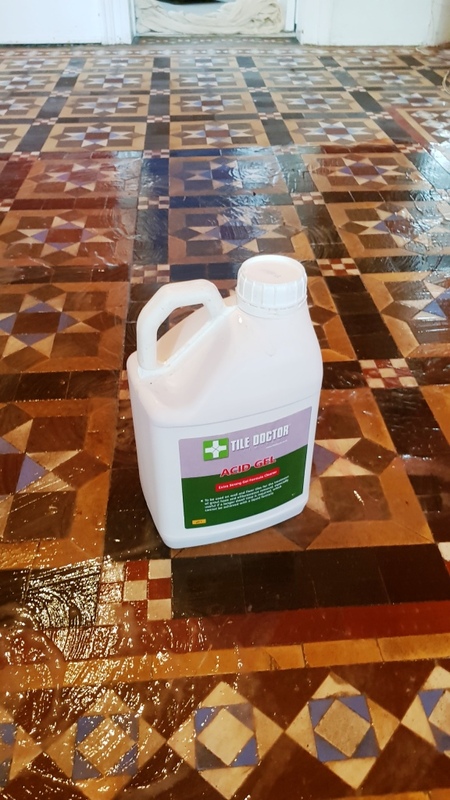 To get the tiles clean we used a combination of Tile Doctor Remove & Go and Acid Gel agitated with a 17-inch 200 grit diamond burnishing pad fitted to a slow speed rotary floor polisher. 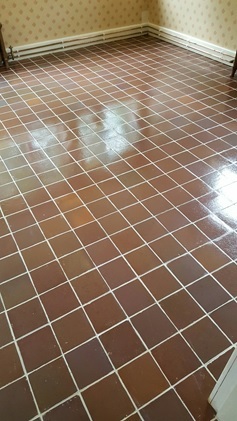 Combined this created a powerful cleaner/stripping action that can remove sealers, epoxy grout haze, urethane coatings, synthetic finishes, glue adhesives and paints. 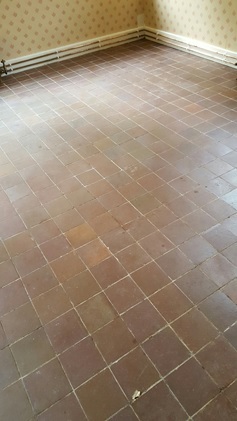 The resulting slurry was removed with a wet vacuum and rinsed off thoroughly with water. 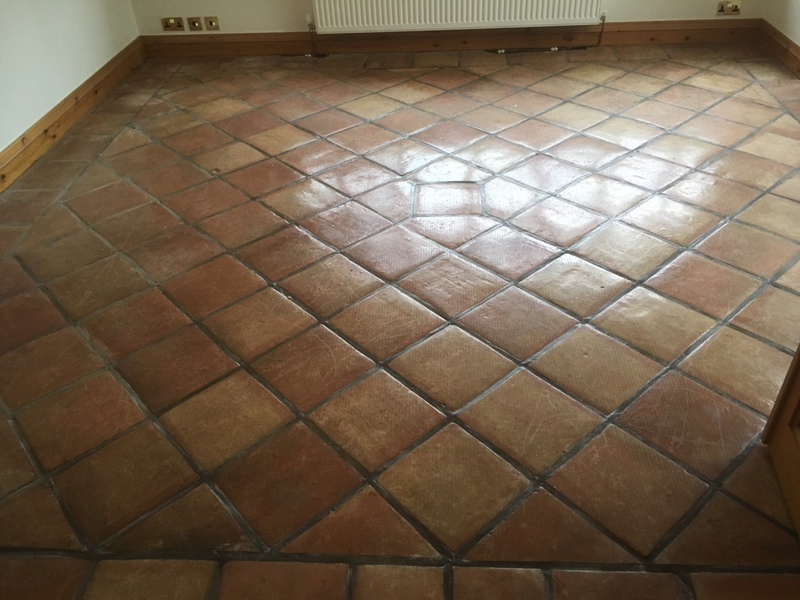 The immediate result showed a marked improvement and you could now get a real impression of how beautiful the floor actually was. 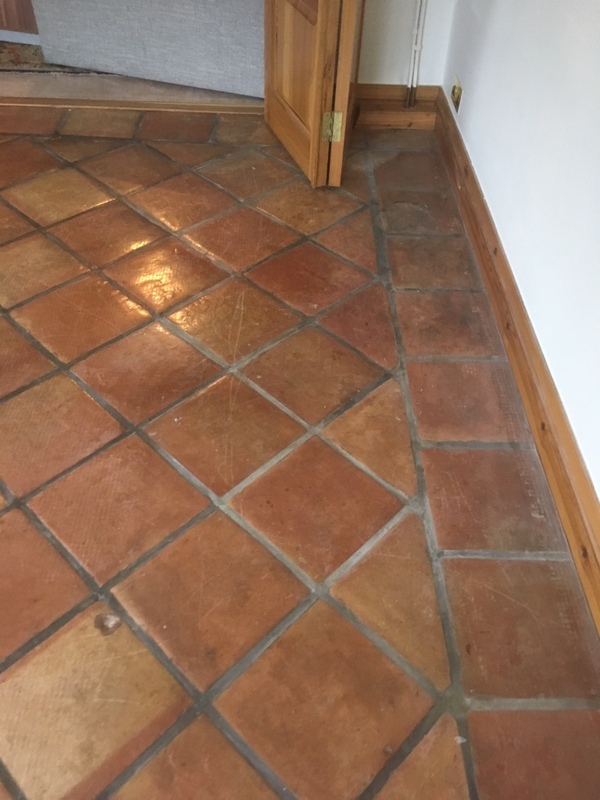 The floor was left to dry overnight, and we returned the next day to complete the restoration with the application of a sealer. 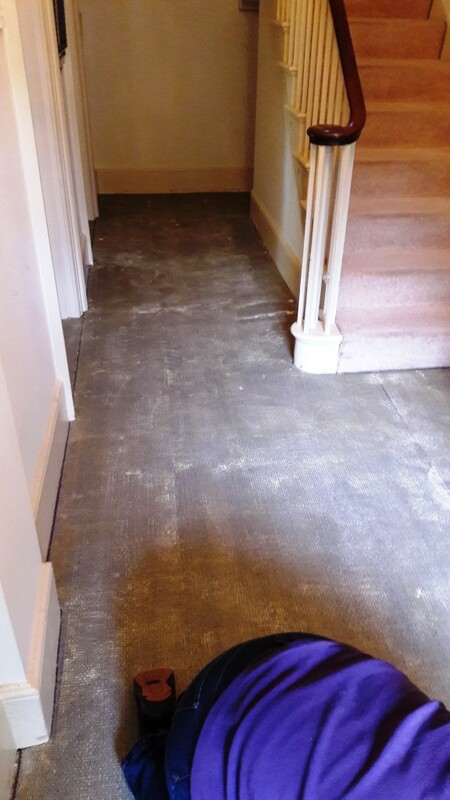 Beforehand he floor was tested with the moisture meter to ensure the it was fully dried. 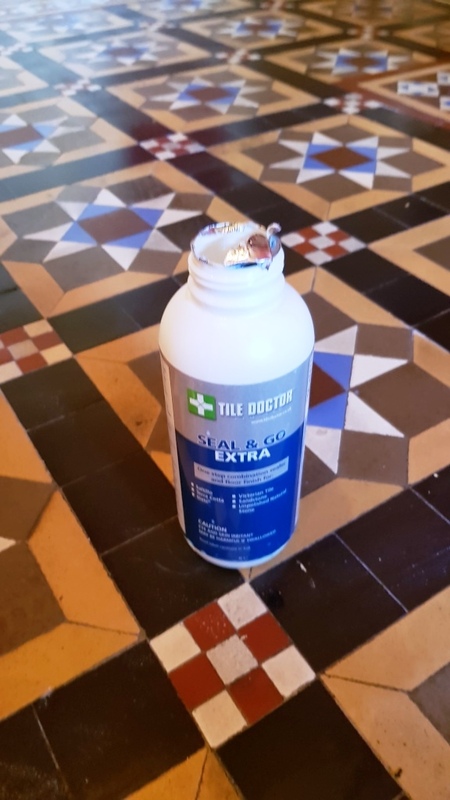 We then sealed the floor with three coats of Tile Doctor Seal & Go Extra which is a full breathable sealer and gives the floor a nice satin finish. 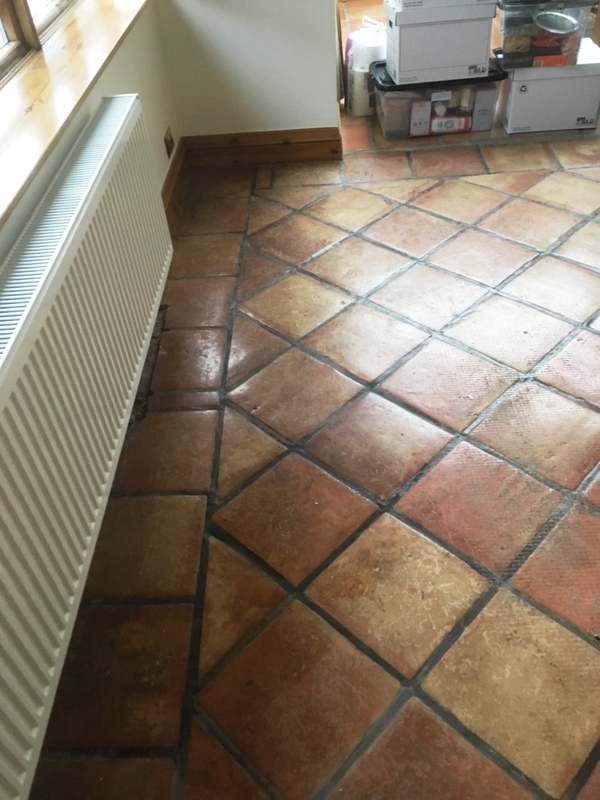 It’s important to use a breathable sealer on these old floors where no damp proof membrane has been installed otherwise moisture can become trapped under the floor and will find its way up the walls instead. 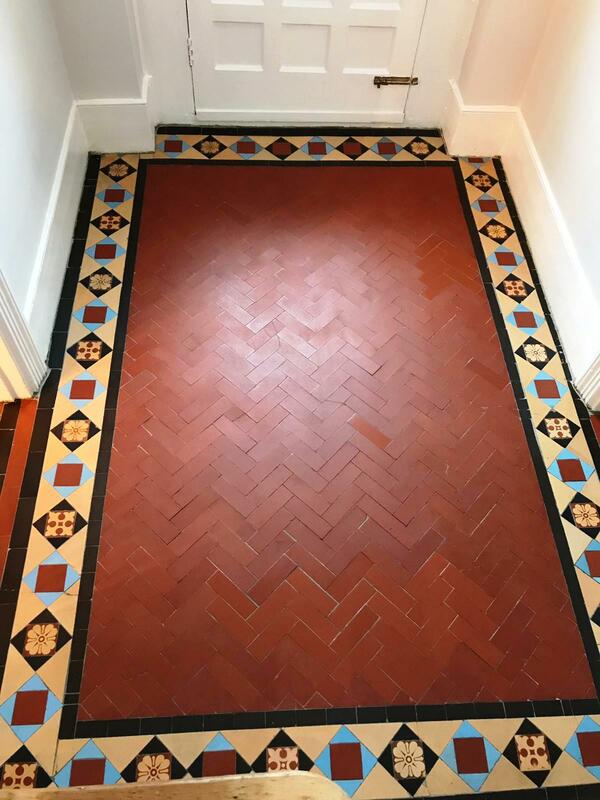 The floor looked fantastic, the client was very pleased, the natural pattern and beauty had been restored to its’ former glory.